Solomon or Shlomo (Hebrew: שְׁלֹמֹה; Standard Hebrew: Šəlomo; Tiberian Hebrew: Šəlōmōh; Arabic: سليمان Sulayman) was the son of king David and the third king of the united Kingdom of Israel, which at that time also included the Kingdom of Judah. The name Solomon (Shlomo) means "peaceful," or "complete," from the Hebrew Shelomoh. The name given by God to Solomon through the prophet Nathan is Jedidiah, meaning "friend of God" (2 Samuel 12:25). Solomon's case is one of the few in the Bible where the name given by God does not stay with the character. Solomon's birth is considered a grace from God, after the death of the previous child between David and Bathsheba. According to the Bible, Solomon was the builder of the first Temple in Jerusalem, also known as Solomon's Temple. He was renowned for his great wisdom, wealth, and power. He is described as an Israelite potentate of unequaled reach in biblical history, his empire's borders stretching from the Euphrates to the Nile. He founded an international court and created a modern bureaucracy to complete the centralization of power in his realm. However, this king of a supposedly great empire is nowhere evident in ancient sources from his time outside of the Bible. The biblical portrait of Solomon is paradoxical. On the one hand, he is portrayed as a pious king of supreme, divinely-endowed wisdom. On the other, he foolishly allowed his love for his foreign wives to lead him into idolatry. His administrative policies and heavy taxes caused disaffection among the populace, especially of the northern tribes. His sin, and these policies, were ultimately responsible for the splitting of his kingdom in two and the eventual fall of both Israel and Judah into the hands of foreign invaders. In terms of his contribution to literature, Solomon is traditionally credited with the authorship of the Song of Solomon, the Proverbs, and Ecclesiastes, along with a large number of apocryphal and pseudepigraphal works. He is the subject of many later legends and is also in a line of the greatest Kabbalah masters. Solomon is David's second son by Bathsheba. His history is recorded in 1 Kings 1–11 and 2 Chronicles 1–9. He succeeds his father (reigned circa 1005 to 965 B.C.E.) to the throne while still a teenager before David's death. David chooses him as his successor, passing over the claims of his elder sons. Solomon's early enthronement is hastened in consequence of the attempt of David's eldest surviving son, Adonijah, to usurp the kingship. Supported by David's military chief, Joab, and the venerable priest Abiathar, Adonijah's attempt to reign is cut short when the prophet Nathan and Bathsheba prevail on David to have young Solomon publicly anointed and proclaimed as king, at the very moment when Adonijah is celebrating his own ascendancy. Sensing defeat, Adonijah seeks sanctuary in the sacred tent that houses the Ark of the Covenant, clinging to the horns of the altar. Solomon grants him clemency, if "he shows himself to be a worthy man" (1 Kings 1). Near death, David charges Solomon to follow God's commands "as written in the Law of Moses." He also advises the young monarch to collect certain blood debts David himself has not been able to collect, especially that of Joab, David's erstwhile general who lately had supported Adonijah's aborted coup. "Do not let his gray head go down to the grave in peace," David commands. After David dies, Solomon dutifully obeys his father's last wish. He also takes Adonijah's request to marry David's beautiful young concubine, Abishag, as evidence of his elder brother's unworthiness, and orders his death as well. "The kingdom was now firmly established in Solomon's hands," the biblical author concludes (1 Kings 2). Solomon's judgment between the two women who claimed the same baby. While his ruling concerning the two women who both claimed the same child is by far the most famous of Solomon's judgments, there is no doubt the biblical authors intend his response to God's promise in 1 Kings 3 to be even more emblematic of his wisdom. "Ask for whatever you want me to give you," God offers in a dream. "Give your servant a discerning ear to govern your people and to distinguish between right and wrong," Solomon replies. Pleased with his non-materialistic wish, God tells him that not only will he receive wisdom greater than any other man, but also great wealth, power, and prosperity. The story of Solomon's wise ruling in the case of the two women follows immediately after this, as evidence of God's boon of great wisdom. 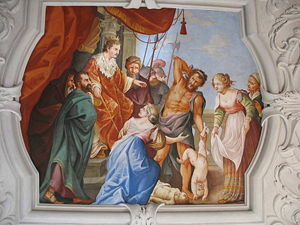 Solomon orders the disputed infant to be brought forth and commands his aides to hack it into two equal pieces. He ultimately awards the child to the woman who offers to rescind her claim of motherhood so that the child may live. The Bible is quite specific as to the number of Solomon's literary works and the extent of his wisdom: "He spoke three thousand proverbs and his songs numbered a thousand and five. He described plant life, from the cedar of Lebanon to the hyssop that grows out of walls. He also taught about animals and birds, reptiles and fish. Men of all nations came to listen to Solomon's wisdom, sent by all the kings of the world" (1 Kings 4:33–34). Historians understand this to be a description of Solomon's cosmopolitan court, where wise men from many nations would gather—wisdom being an international movement for the education of nobility. Solomon, who sought to make his court the most accomplished and up-to-date of any in the world, may have been a collector more than an author. The idea that Solomon's wisdom is God-given is important to various Judeo-Christian beliefs. The biblical Book of Proverbs, ascribed to Solomon, is a practical guide to morality and manners in various Jewish and Christian denominations. Many believe that Solomon also wrote the biblical book of Ecclesiastes in which there is established a sense of the vanity of man's feeble accomplishments, characterized as "a striving after wind." During Solomon's long reign of 40 years, the Hebrew monarchy reached its greatest splendor. This period has well been called the Golden Age of Israelite history, a veritable precursor of the Messianic Age. "Judah and Israel dwelt safely, every man under his vine and under his fig tree, from Dan even to Beersheba" (1 Kings 4:25). The Bible describes Solomon as a great imperial potentate, who "ruled over all the kingdoms from the River [Euphrates] to the land of the Philistines, as far as the border of Egypt." His yearly tribute income is reported as 666 talents (weight) of gold (1 Kings 10:13). While this figure may or may not be accurate, the reason for the gifts is clear, since Solomon possessed no less that 40,000 stalls for horses and chariots and 12,000 mounted cavalry. On the other hand, the biblical account also describes the tribute-giving as a two-way street. While Hiram of Tyre presents Solomon with both gold and copious amounts of valuable raw materials for his building projects, Solomon, in exchange, sends large yearly allotments of food to Tyre. He even conscripts no less than 30,000 "men of Israel" to serve Hiram, as a gesture of peace (1 Kings 5). Later Solomon cedes to Hiram 20 towns in Galilee, with which Hiram was not satisfied (1 Kings 9). Solomon's building projects in Jerusalem are impressive. Construction of the Temple took seven years to complete, while Solomon's palace took thirteen. Forced labor on a massive scale is involved, but this time not involving "men of Israel." Instead, Solomon conscripts slaves from among the non-Israelite tribes of Amorites, Hittites, Perizzites, Hivites, and Jebusites (1 Kings 9). When the Ark of the Covenant is finally installed in the Temple, the king celebrates by offering 22,000 oxen and 120,000 sheep as a sacrifice. There follows a 14-day feast involving a "great congregation." After the first 20 years of Solomon's reign are finished, not only is his kingdom firmly established, but his glory is unparalleled throughout the world. Solomon then had another dream. Once again God promises wisdom and prosperity, but this time a warning is also given: "If you or your sons turn away from me…to serve other gods and worship them, then I will cut off Israel and the land I have given them and will reject this temple I have consecrated for my Name" (1 Kings 9:6-7). Solomon erected many other buildings of importance in Jerusalem and in other parts of his kingdom. The Bible reports that he fortified the walls of Jerusalem as well as the strategic towns of Hazor, Megiddo, and Gezer. It describes impressive water works, desert fortresses, store cities, ship building projects, and large housing projects for his military, including huge stables (1 Kings 9). Solomon engaged in extensive trade on land with Tyre, Egypt, and Arabia and by sea with Tarshish (Spain), Ophir, South India, and Africa. 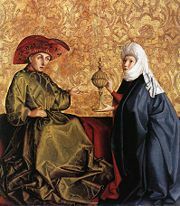 Impressed by tales of his wisdom, the wonderfully rich Queen of Sheba visits with generous gifts of gold and spices, and Solomon in turn gives her "all she desired" (1 Kings 10). According to a later Ethiopian tradition, a son was born of this union, Menelik I, who would become the first emperor of Ethiopia. The rest of Solomon's reign as described in the Book of Kings is far less bright and prosperous, as his fatal flaw, namely his weakness for women, manifests. This portion of his reign is clouded by idolatry, mainly resulting from his intermarriages, which the biblical historian denounces as contrary to God's will. Besides his famous marriage to the princess of Egypt, according to 1 Kings' 11:4, he accumulates 700 wives and 300 concubines. Even if the numbers are exaggerated, many of these must have been political marriages sealing alliances with neighboring tribes and clans; the Bible specifically names Moabites, Ammonites, Edomites, Sidonians, and Hittites among Solomon's wives. For their sakes, and no doubt to honor the peoples and kings they represent, Solomon offers sacrifice to their deities as well as to Yahweh of the Israelites. The sacred historian declares that God now turns against Solomon, mobilizing the Edomite prince Hadad and the Aramean leader Rezon against him. Finally, one of Solomon's own officials, Jeroboam, son of Nebat, rebels against him, with the encouragement of the prophet Ahijah (1 Kings 11). Later, Jeroboam would go on to become the first king of the northern Kingdom of Israel, while Solomon's son Rehoboam would rule over the southern Kingdom of Judah. A political reading of the Book of Kings gives another reason for Solomon's decline and the fall of his kingdom: excessive taxation and political misjudgments. Instead of honoring the traditional political division of 12 tribes he creates new administrative districts, each responsible to provide one month of taxes and labor for his court. Yet among these the area occupied by Judah is conspicuously absent (1 Kings 4:7-19). He also drafted the men "out of all Israel" for forced labor to work on his many building projects (1 Kings 5:13-17). It is likely that "all Israel" meant mainly the northern tribes, the "house of Joseph," because the chief taskmaster was the very Jereboam who would later lead the rebellion of the northern tribes that split the kingdom (1 Kings 11:28). Furthermore, while he wooed Pharaoh's daughter, thus solidifying peace and security on his kingdom's southern border, he disregarded the people on the northern border by selling 20 cities of the Galilee to Hiram, the king of Tyre (1 Kings 9:11-13). All these measures infuriated the people of the northern tribes, who complained to his son Rehoboam, "Your father made our yoke heavy" (1 Kings 12:4). These policies as much as anything contributed to their decision to rebel and led to the division of Solomon's kingdom. Most scholars accept the historicity of Solomon's kingdom at face value, based upon the verisimilitude of the Bible's account. Critics, however, argue that much of his glory was exaggerated by later authors based on their need to explain the reality of their own times with reference to a Golden Age from which the kings of Judah and Israel had fallen. Thus, archaeologist Israel Finkelstein theorizes that Solomon's kingdom is a kind of backdated version of that of the Israelite dynasty of Omri (ninth century B.C.E. )(father of Ahab), the first Israelite empire for which extra-biblical records exist. Omri and his sons are denounced by the Bible for honoring the deities of their vassal states, and the story of Solomon is written to demonstrate that this practice is the root cause of Israel's woes. Biblical deconstructionists also argue from archaeological evidence, which indicates that Jerusalem in Solomon's time, the tenth century B.C.E., was far too small to have served as an administrative center for an empire such as that of the biblical Solomon's. Also, some of the city walls that the Bible describes as being built by Solomon have been uncovered, and they seem to date for a century or so after his reign. The large stables and other structures unearthed by earlier archaeologists and cited of proof of the Bible's accuracy are now dated to the ninth century B.C.E. or later. However, the dating methods that came up with this result have been challenged. Historians who accept the historicity of Solomon's empire give more credence to passages from the Book of Kings which seem to reflect actual court documents. Furthermore, the fact that a large building such as Solomon's Temple has not been found is no proof that it never existed. New finds of remains of massive structures that can be dated to the time of David and Solomon indicate that much evidence from that era remains to be uncovered. The Bible describes the young Solomon as being committed to "walk in [God's] ways… as it is written in the Law of Moses" (1 Kings 2:3). But biblical critics wonder: did the Law of Moses, as such, even exist in Solomon's time? This is the question serious students of the Bible, both pious and secular, must confront. Some critics believe that while the Law of Moses may have ancient roots, it was first compiled and implemented nationally as late as the time of King Hezekiah in the eighth century B.C.E. There is archaeological evidence that in Solomon's day only the religious elites of Israel and Judah would have viewed Yahweh as the only deity, or think that this God alone must be worshiped. Many ordinary Israelites worshiped not only God as Yahweh, but also his feminine counterpart as Astarte or Asherah. The "Yahweh-only" ethic eventually prevailed during the Babylonian captivity and thereafter. Thus it was only natural that Solomon, who lived during a time when the concept of God was not so exclusive, would honor other deities besides that of his own tribe of Judah. Furthermore, statements conveying religious judgments about Solomon in the Book of Kings largely come from the redaction written by the Deuteronomistic Historian in the sixth-century B.C.E., who impressed his orthodox religious values onto a collection of older texts. Despite the view of "sacred history" that attributes the division of Solomon's kingdom to religious apostasy, his honoring of "foreign" deities could be seen as natural, or even a manifestation of his wisdom. Solomon, from this point of view, was an ancient ecumenist! Rather, it would have been economic, political, and military issues that truly caused Judah and Israel to go their separate ways, rather than the idolatry of King Solomon. Indeed the description of Jeroboam's rebellion in 1 Kings 12 describes it more in terms of a labor dispute than a religious one. One reason for the paucity of evidence for Solomon's empire may be the relative weakness of the surrounding nations in his day. Egypt had been weakened by the Sea Peoples; Mesopotamia was in a period of small warring states before Assyria had risen to supremacy; and even the Mycenaean Civilization was in decline. Hence, Solomon's empire, strengthened by its alliance with the Phoenicians, was in an unusually favorable situation to exercise hegemony over the ancient world. The division of Israel after Solomon's death would bring this favorable condition to an abrupt end. One can speculate what might have been, had Solomon not fallen into idolatry and had his policies been more successful. Perhaps Solomon was providentially situated so that the messianic hope that Israel could stand as the "Kingdom of God" and a "light to the nations" could have been achieved in his day. The Bible says that Solomon was a prolific writer of proverbs and other works. Although the tradition of Solomon as a fount of Jewish wisdom literature is thus quite ancient, it is questionable whether he wrote all the works traditionally ascribed to him. The Book of Proverbs, a collection of wisdom sayings, is most likely to have a kernel dating from Solomon's time. The first proverb in the collection, as well as the opening verse of Proverb 10, provides the heading: "The Proverbs of Solomon." Yet, since King Hezekiah is mentioned in Proverb 25, the collection in its current form cannot date from earlier than the seventh century B.C.E.. Yet if Solomon were a collector of international wisdom, he might very well have compiled an earlier version of the book. The claim to Solomonic authorship is much weaker for Ecclesiastes, which claims to be the work of someone called "The Preacher" (Hebrew: Koheleth), a "son of David" who is a ruler of considerable worldly wisdom. Solomon, of course, is the personage implied. However, most scholars consider the work to reflect the literary style and philosophy of a considerably later era: of the period of Babylonian exile even as late as the third century B.C.E. The work usually referred to as the Song of Solomon, is in reality entitled "Song of Songs." It is a love poem or dialog between a young nobleman and his bride or lover. Most scholars consider it to be a composite work by several anonymous authors. Because of this, it is not easy to date. The romantic notion that it is a love song composed by Solomon for his Egyptian wife is attractive, but unlikely. A great number of non-biblical works are also attributed to Solomon, notably the deutero-canonical Wisdom of Solomon and the Psalms of Solomon. The Jewish historian Eupolemus, who wrote around 157 B.C.E., included copies of apocryphal letters exchanged between Solomon and the kings of Egypt and Tyre. The idea that the historical Solomon penned these works is viewed with a high degree of skepticism. Solomon is an important, if controversial figure, in Judaism and occupies a very important part in rabbinical legend. He is one of the zaddikim (the just), a friend of God, and "he who built the Temple." He is particularly honored for asking the Lord for wisdom after God had promised to grant him whatever he wished. He is considered to have been a prophet, and a godly judge without equal. Some rabbis esteem Solomon so highly that they deny that he fell into idolatry, claiming instead that he only failed to restrain his wives from the practice. However, the Tanakh (the Hebrew Bible) clearly holds Solomon's idolatry responsible for God's division of the united kingdom. 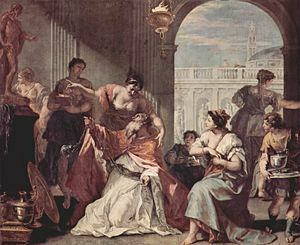 Talmudic authorities, too, focus on Solomon's weakness for women and his sin of idolatry. His marriage to Pharaoh’s daughter is particularly condemned, as is his idolatry in association with his other foreign wives. It is indicative of the ambiguous place of Solomon in Jewish tradition that when the Talmudic sage Rabbi Eliezer was asked by his students for his opinion of Solomon's place in the life in the world to come, he reportedly gave an evasive answer. Solomon, through his connection to the Queen of Sheba, also serves as a link between Judaism and Africa, where several African tribes have claimed descent from Solomon and identify themselves as Jews, including the Falasha, though many also see them as from the lost tribe of Dan. They have been granted the right of return (to live in the modern state of Israel). The Lembo in South Africa also claim a Jewish identity. In Christian tradition, Solomon is viewed as a great king of Israel who reigned in peace with godly wisdom with the tragic exception of his worshiping foreign deities. He represents Israel's Golden Age before it fell into the sin of idolatry and rebellion against God. Solomon's building of the Temple makes him a forerunner of Jesus, the descendant of David who would himself be the true Temple. As the Temple also represents the Church, Solomon's corruption gives a foretaste of the corruption and ruin that can come upon the church when its people fall into sin. Solomon is one of the ancestors of Jesus Christ listed in Matthew 1. Jesus himself refers to both Solomon's wisdom and his splendor (Matthew 6:29; 12:42). In the Christian scriptures, Solomon is traditionally credited with the authorship of Proverbs, Ecclesiastes, and the Song of Solomon. The Catholic Bible includes the Wisdom of Solomon in the approved Old Testament Apocrypha. Other works supposedly about or by Solomon, some of which are deemed heretical, are included in the New Testament Apocrypha (see The Solomon of Legend below). The Qur'an refers to Solomon as Sulayman. He is the son of David, a prophet, and a great ruler imparted by God with tremendous wisdom, favor, and mystical powers. Solomon was said to have under his rule not only people, but also hosts of invisible beings (i.e., jinn). And like his father David, Solomon is said to have been able to understand the language of the birds, and to see some of the hidden glory in the world that was not accessible to common human beings. The Wisdom of Solomon, written probably in the second century B.C.E., portrays Solomon as an astronomer. As the kabbalistic tradition developed, many other legends and works of Solomon emerged in association with his wisdom and other powers. Some Jewish legends endow him with magic powers, portraying him as being able to fly by means of a huge eagle or magic carpet. His majestic throne was the most opulent ever created and also had wondrous mechanical qualities. Solomon's mastery of demons is a common element in later Jewish and Arabic mythology legends, and is often attributed to possession of the magic ring called the "Seal of Solomon." In Arabic legend, Solomon is well represented. A letter purporting to be from him to the Queen of Sheba invites her to convert to Islam. He is said to possess a magical ring by which he commands various natural forces. 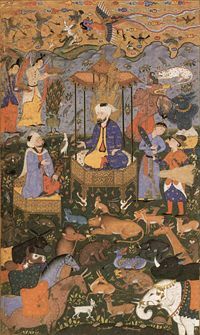 Arabic tradition, unlike its Jewish counterpart, makes much of Solomon's ability as a warrior, especially his love for horses. In one story, Solomon dies at age 53, having reigned 40 years, but without entirely completing his work on the Temple. The angel of death takes his soul while he is leaning upon his staff, so that the jinn who assisted him in constructing the Temple would not know that he had passed away. Only a year later, when the jinn had completed the task, was Solomon's death recognized. The Gnostic Apocalypse of Adam, which may date to the first or second century, refers to a legend in which Solomon sends out an army of demons to seek a virgin who had fled from him, perhaps the earliest surviving mention of the later common tale that Solomon controlled demons and made them his slaves. This tradition of Solomon's control over demons appears fully elaborated in the early Christian work called the "Testament of Solomon," with its elaborate and grotesque demonology. The ancient Imperial legend of Ethiopia, as told in the Kebra Nagast, maintains that the Queen of Sheba returned to her realm from her biblical visit to Solomon, pregnant with his child, and giving birth to a son by the Mai Bella stream in the province of Hamasien, Eritrea. This child would eventually inherit her throne with the new rank and title of Menelik I, Emperor of Abyssinia. The dynasty he would establish would reign in Abyssinia with few interruptions until the overthrow of Emperor Haile Selassie in 1974 C.E. The Table of Solomon was said to be held in Toledo, Spain during the Visigothic rule and was part of the loot taken by Tarik ibn Ziyad during the Islamic conquest of Spain, according to Ibn Abd-el-Hakem's History of the Conquest of Spain. Finally, numerous stories, novels, and even motion pictures, have been made about the fabulous wealth contained in King Solomon's mines. ↑ Steven Erlanger, David's Palace is Found The New York Times, August 5, 2005, Retrieved July 28, 2007. This page was last modified on 10 October 2015, at 16:11.